From Nongsa Point, we sailed south through the Riau Islands and along the coast of Lingga Island. The water was much cleaner than the water along on the west coast of the Malaysian Peninsula. The number of fishing traps decreased but we were soon introduced to fish attracting devices. They light up the houses at nightand place nets underneath that capture the fish attracted to the lights. They can look very beautiful along the water during the day, but if they aren’t lit up at night they become a dangerous obstacle in the water for sailing boats. The wind remained constantly on our nose prohibiting us from ever raising our sails. Instead of sailing comfortably along with the waves we are always battering against them (I can confidently say that I am not prone to seasickness). At night we would take shelter from the wind and waves, tucked in behind one of the 18,000 islands of Indonesia. Occasionally, we would get a local visitor motoring or paddling out to our boat to say hi. Our first exciting stop south was Belitung Island. Located off the east coast of central Sumatra, we had heard it compared to the British Virgin Islands and Maldives. We were curious what would await us when we arrived. The majority of beautiful spots are along the northwest coast of the island. There is a very small village near the beach with simple restaurants, a couple of homestays, and, more secluded, a hotel farther down the beach (usually full of Chinese tourists). Off the coast lie several small islands, each picturesque with a pristine strip of beach or large granite rocks. There is nothing better than spending the days hopping between islands, relaxing, snorkeling, and enjoying the beautiful scenery. About 35 minutes away by car or motorbike is the main town, Tanjung Pandam, of the island. Here you can find more homestays, hostels, and even a five star hotel. There are more restaurant options, hardware stores, and markets. We were there during Ramadan so I believe the atmosphere was slightly subdued. Everyone is incredibly friendly and welcoming. We spent about a week anchored off the coast on the northwest side of the island and only ever saw Indonesian or Chinese tourists, and very few at that. During the week, we would undoubtedly have any island we visited to ourselves. On the weekend, the number of tourists would grow slightly and we would have some company on the islands, especially Lengkuas Island with the lighthouse because it has one of the best snorkeling spots around. Inland near Tanjung Pandam are the remains of one of the many tin mines that used to dominate the island. Belitung and its brother island, Bangka, used to produce over 90% of the tin used by Indonesia. This old mining spot, called Danau Kaolin, has striking aqua water and a white mineral/sand mixture that makes for a stunning contrast. If you are ever looking for an island off the beaten path in Indonesia, I recommend Belitung. The only two ways to get there, if you don’t have your own boat, is to fly from Jakarta or Batam Island. The effort to get there will be well worth your time and be prepared to stay awhile to soak in the beauty. From Belitung we headed southeast across the Java Sea. For an approximate 250 nautical mile trip across the open sea, we spent fifty straight hours bashing through the waves, nose thrust into the wind. The captain and I rotated through four-hour shifts. This method of keeping watch is common between people on a boat and I know I had it easy compared to those week or even month long ocean crossings. After more than two full days of cruising, we arrived at Karimunjawa Island. The Karimunjawa Archipelago contains 27 islands, most of which are uninhabited. I expected to find a small village with even less development than the beach of Belitung. As we rounded the corner to find our anchorage a large, concrete dock came into view and I knew immediately that this place would have more to offer. 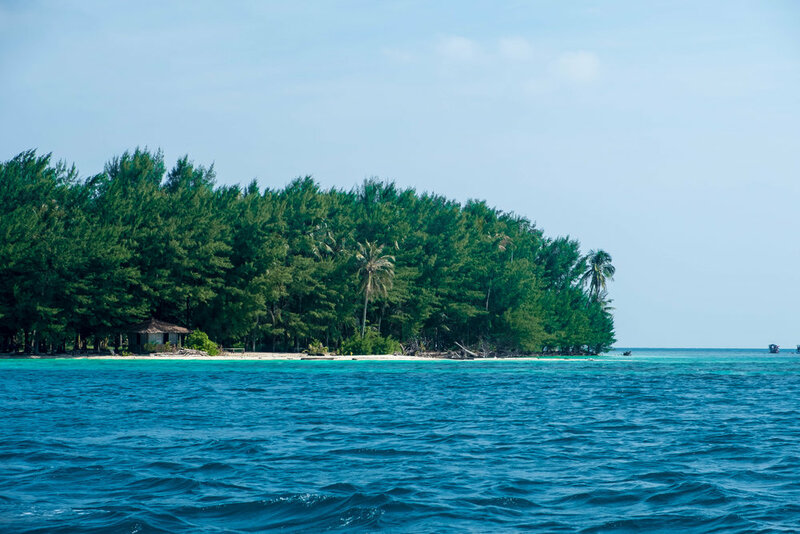 Karimunjawa Island has apparently been a popular getaway for people from Surabaya, the second largest city in Java, and is slowly becoming a popular backpacker spot with daily ferries between the island and Java. There is a small expat community, a few nice restaurants, and a wonderful night market where they will cook you a delicious fish for under $3! The island is slowly becoming a popular dive spot and there are plenty of boatmen willing to take you out to a few snorkeling places. There are a few very nice beaches on the island and plenty of great viewpoints to watch the sunrise or sunset. As it was recently included in the newest version of Lonely Planet, I expect the number of visitors to the island will be increasing. After refueling, restocking, and relaxing on the island for a few days, it was time to head to our final destination – Bali. Leaving Karimunjawa, we undertook the last leg of our journey to Bali. After 30 hours of straight sailing, we arrived at the Surabaya Channel. Not knowing what to expect through the channel we spent the night outside and woke up early to navigate our way through. The channel was overflowing with ships, but all of them were anchored making it relatively easy to cruise our way through. There were some military ships and even an active submarine that came up next to us near the exit of the channel. With another 30 hours of straight sailing we arrived at Menjangan Island, which lies off the northwest coast of Bali. Menjangan is part of the West Bali National Park and on the island we had some close encounters with Javanese deer and were welcomed by a lovely family praying at one of the Hindu temples. Around the island are some of the best snorkeling and dive spots in Bali and it was a beautiful place to have to ourselves once the day-visitors left. Leaving Menjangan we finally arrived at Lovina Beach, Bali. We cruised over 1600 nautical miles in just over seven weeks. I learned a great deal about life on a boat, a fair bit of seamanship, and most importantly, common sense. It was a great introductory adventure on a boat and I look forward to more sailing adventures in the future. I am incredibly thankful for the opportunity from Captain Rob and could not have been more lucky with Larissa, my fellow crewmate. For now, it is time for a bit of relaxation in Lovina before my next exploration – The Philippines.